FROM THE WHAT THE HELL IS GOING DEPARTMENT…. I’m trying to watch 48 Hour Mystery on Philip Haynes Markoff, the Craigslist Killer and I can’t get away from Jamie Lee Curtis. The Dannon Activia Commercial is almost as annoying as those car insurance commercials (search previous post). You can’t get away from her! Now Hyundai has put “hidden cameras” in its cars while “prospective buyers” are test driving them. How original. I believe it! Ugh – now you know why we’re waiting for the BYON world of the future and why people will do anything they can to avoid having to watch these commercials. Are the brainiacs in the Marketing and PR departments taking the very same anti-depressants? I saw this post and it made me think. “Abilify ads disclaimer lasts longer than the ad itself and death is mentioned three times? Oh yeah, it is another one of those “scientifcally” studied and approved “safe” mainstream drugs. You know, the ones that cause 140,000 deaths every year even when properly precribed and taken, and presumably when the patients are properly “assessed” by the AMA’s own admission. Do you care to try to justify and explain away those figures? Yes, and it can damage it quite severly too. Hostility (just a trade off? ), Aggression (see previous), Mania (are we talking about quitting smoking? ), Suicidal thoughts (I guess if you can’t smoke anymore why not just get it over with? ), Abnormal sensations (you mean “kicking”), Hallucinations (that’s not good), Anxiety (yep), Panic (that’s why I never got on anti-depressants – but this is for stopping smoking), Agitation (don’t we all? ), Anger (not necessarily unique to Chantix – can’t sue over that right? ), Depression (as if we’re not all depressed by what’s going on in the world? ), Changes in behavior (if you want to stop smoking then yeah that’s going to happen – but add some pill to the mix? ), Changes in thinking (hopefully not while driving), Paranoia (again – don’t need any more incentive to be scared of what’s going on around us), Confusion (I’m already there), Worsening mental health problems (who approved this drug? ), Rash (uch), Redness (see previous), Peeling of skin (triple uch), Life-threatening allergic reactions (quadruple uch), Swelling of the face (how high can we go? ), Swelling of the mouth (from a pill – what pill can do that? ), Swelling of the throat (no comment), Trouble breathing (that’s bad), They keep going – I can’t keep writing because the baby just woke up and is crying but quickly add Sleep problems, Constipation, Vomiting, Gas……. 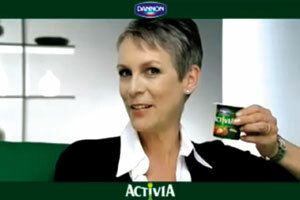 Can we add an uncontrollable urge to watch Jamie Lee Curtis and her Activia Yogurt Commercials? So why do they even make these commercials? Why would anyone with a brain buy Dannon Activia Yogurt (I love Dannon Light and even once got a Dannon Olympics Knapsack by mailing in – yes I did it – 10 proof of purchase tops) because…. Jamie Lee Curtis???? is sitting on a chair while some “real people” are taking the time to film themselves eating Dannon???? Why also would rational thinking human being take a pill that the commercial promoting has disclaimers that last far longer than the supposed benefits. The punishment for this fellow should be to watch Jamie Lee Curtis (not in Halloween), but in these annoying Activia Commercials – over and over and over again… Now that’s punishment. Still In Beta, GCMP.tv syndicates to 150 Viral Video and Social Media Sites as well as mobile content to 70 countries. A little about myself, I head the digital media and emerging technologies division of GCMP.tv. In addition to being a leading New York media strategist, Brian specializes in social commerce, webcasting, building your own network (BYON), ghostwriting and blogging. iProgram specializes in Live To Phone Technologies, mobile video and marketing strategies from its base in New York City.